Throughout the decades, The Shadow has served as a timeless agent of justice, bringing death and disaster to tyrants and criminals alike. During the decadent 1980s, this mysterious Master of Men faced perhaps his deadliest opponents yet: the Seven Deadly Finns, a crime family gripping New York City in a stranglehold. When The Shadow's network applies pressure to their vast operations, the Finn brothers push back, enlisting serial killers and terrorists into their ranks. The violence escalates, leading to an explosive confrontation atop the Empire State Building and a shock ending which no one — not even The Shadow — could know! 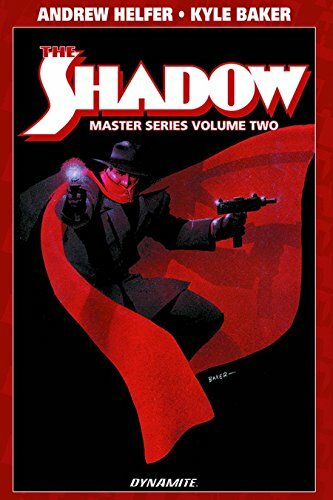 This second volume of The Shadow Master Series collects the critically acclaimed "Seven Deadly Finns" storyline by Andrew Helfer and Kyle Baker, as well as Helfer and Marshall Rogers' prologue "Harold Goes to Washington," in which The Shadow races to save President Reagan from a most unlikely assassin!